THIS AGREEMENT is made effective the ______ day of _______, 20__, between PHARMACY BUYER, LLC, a ___________ limited liability company (the “Company”) and Mr. Competent Pharmacist, an individual (the “Manager”). WHEREAS, the Company desires to retain the services of the Manager and the Manager desires to make the Manager’s services available to the Company. 1. Employment. The Company hereby employs the Manager and the Manager hereby accepts employment subject to the terms and conditions contained in this Agreement. The Manager is engaged as an employee of the Company, and the Manager and the Company do not intend to create a joint venture, partnership or other relationship which might impose a fiduciary obligation on the Manager or the Company in the performance of this Agreement. 2. Manager’s Duties. The Manager is employed on a full-time basis. The Manager will use the Manager’s best efforts and due diligence to achieve the most profitable operation of the Company and the Company’s subsidiary corporations, partnerships and entities which is consistent with developing and maintaining a quality business operation. 2.1. Specific Duties. Initially, the Manager will serve as manager of the Company’s pharmacy in ________, ________, known as “__________ Pharmacy.” The Manager will perform all of the services required to fully and faithfully execute the positions to which the Manager is appointed and such other services as may be reasonably directed by the Manager’s supervisor. 2.2. Supervision. The services of the Manager will be requested and directed by Mr. ___________, or such person as Mr. ______ or the President of the Company may direct. (c) directly, indirectly or through any Affiliate (as hereinafter defined), invest in, participate in or acquire an interest in any Pharmacy Business (as hereinafter defined). 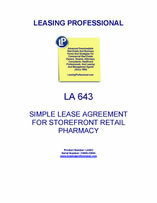 For purposes of this Agreement, the terms: (x) “Pharmacy Business” means owning, managing, operating, controlling, engaging in or being connected as a partner, investor, stockholder, creditor, guarantor, advisor, employee, independent contractor or consultant in the business of selling pharmaceutical and over-the counter drugs and related merchandise; (y) “Affiliate” means as to any Person (as hereinafter defined), each other person that directly or indirectly (through one  or more intermediaries) controls, is controlled by or is under common control with such person; and (z) “Person” means an individual, corporation, partnership, association, joint stock company, trust, associate (as defined in regulations promulgated by the Securities Exchange Commission) or other legally recognizable entity. The limitation in this paragraph 3 will not prohibit any investment by the Manager in securities which are listed on a public exchange or the National Association of Securities Dealers Automated Quotation System and issued by a company, firm, corporation, partnership, trust or other entity involved in the Pharmacy Business, provided that the Manager, the Manager’s family and Affiliates own in the aggregate not more than five percent (5%) of the outstanding voting securities of the entity. 4.1. Base Salary. The Company will pay a base salary (the “Base Salary”) to the Manager at the bi-weekly rate of $_________ for full-time work in month one and the bi-weekly rate of $_______ for half-time work in months two and three. Payments will be made on the Company’s regular pay days. 4.2. Compensation Review. The compensation of the Manager will be reviewed not less frequently than annually by the Managers of the Company. The compensation of the Manager prescribed by paragraph 4 of this Agreement may be increased or decreased at the discretion of the board of directors of the Company. 5. Term. The employment relationship evidenced by this Agreement is an at-will employment relationship and each of the parties may terminate this Agreement at any time as provided below. Unless earlier terminated pursuant to this paragraph 5, this Agreement will extend for a term of three (3) months commencing on the date hereof. 5.2. Termination without Cause. The Company may terminate this Agreement without cause at any time by the service of written notice of termination to the Manager specifying an effective date of such termination not earlier than thirty (30) days after the date of such notice. In the event the Manager is terminated without cause, the Company will not have any obligation to provide any further payments or benefits to the Manager at the effective date of such termination.